Northbridge&apos;s Keenan Quinama and teammates hold up the Division 5 Super Bowl trophy during the presentation ceremony. FOXBOROUGH — Saturday’s Division 5 Super Bowl between Northbridge and East Bridgewater at Gillette Stadium came down to which team could handle the most pressure. Jake Wood found the end zone on a 5-yard rush with 4:34 left to cap an 11-play, 64-yard drive to put Northbridge ahead, and fellow senior Koby Schofer made a game-sealing interception in the final minute as the Rams knocked off East Bridgewater, 36-34. Northbridge, which had been to the last two Super Bowls and lost both, hadn’t been able to stand up to the pressure. This year, the Rams (12-1) held strong. Northbridge built a 14-0 lead in the first quarter behind a 2-yard rush from Wood and a 7-yard pass from Schofer to Chandler Brooks. Globe staff photos from the state championship games in Foxborough. But the Vikings (11-2) began to mount a comeback before halftime, as senior Ryan Graham tossed two touchdown passes to make the score 16-14 after a field goal from the Rams’ Geoffrey Reichert. The teams traded blows once more before the break. Graham scored on an 8-yard keeper and Schofer found Wood for a 72-yard TD pass to put the Rams ahead, 23-20. LaChapelle, the state’s all-time leader in wins, is Schofer’s grandfather. Schofer finished 16 of 23 for 251 yards and two scores, battling through an ankle injury most of the game. “It’s very special to have your grandson be part of a state championship,” said LaChapelle. “We needed him on offense. We needed him to do what he did, and then he came through at the end. Graham, who had 289 passing yards and five touchdowns, tossed two more scoring passes to give the Vikings a 34-30 lead with 9:30 remaining. But Schofer and Wood brought more pressure that East Bridgewater could handle. 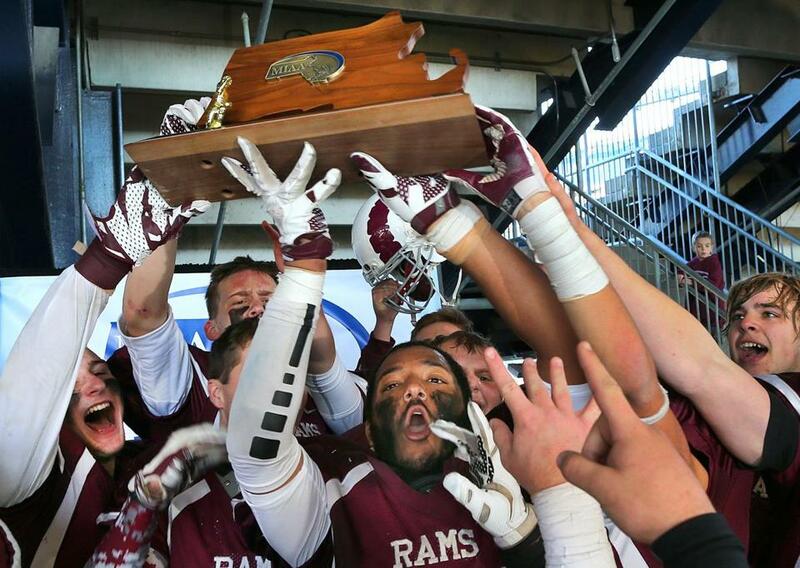 The Rams lost to Abington, 36-6, in last year’s Super Bowl, and fell to Bishop Fenwick, 28-0, in 2013. “In the past few years we’ve kind of come out flat and we got it handed to us,” said Schofer. 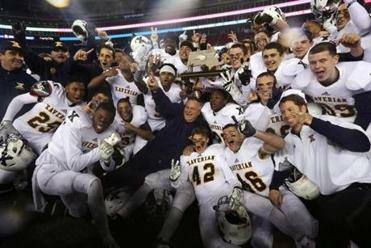 “Being able to finally win one just shows the state that we can play with Eastern Mass. schools,” Schofer said.